Methods for reducing perceived noise in airport vicinities are urgently required. Steep approaches have been identified as one feasible means of achieving the desired magnitude of noise reduction. This thesis makes its contribution to the field by evaluating the applicability of four novel aerodynamic devices for use in steep approaches of commercial transport aircraft. It begins by unpacking the conditions surrounding air traffic noise reduction and steep approach, surveying the leading edge research and outlining the thesis’s specific contribution to the field. The theoretical background knowledge is then gathered. Subsequently, experimental and numerical methods are introduced. The investigations conducted on the basis of these methods and the findings drawn from them are then reported on. The investigated devices can all be seamlessly integrated into the wing through a straight-forward modification of their existing aileron system and spoiler system, respectively. 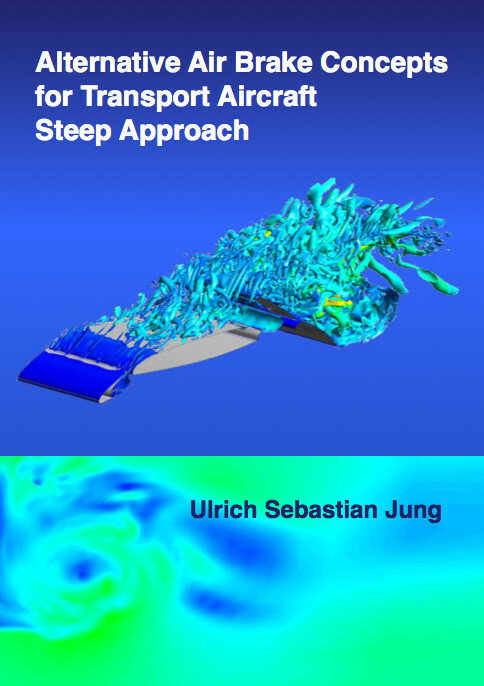 In order to evaluate the relevant steep approach parameters, they are compared with a Baseline configuration - the Baseline being defined as the approach configuration without deployed air brakes. Analogously, conventional spoilers are investigated to provide an additional basis for comparison. The steep approach effectiveness of the devices is evaluated through force measurements. To visualize the flow topology and thereby understand the flow physics underlying the achieved steep approach parameters, flow visualization methods and computational fluid dynamic simulations are utilized. The flow visualization methods utilized comprise tuft flow visualization, stereoscopic particle image velocimetry, and hot wire anemometry. To address the feasibility of using these devices with regard to possible horizontal tail plane buffet issues, a thorough investigation of the wing wake is also reported on.